Fan Forum > General Discussion > Television > Will and Grace (NBC) #5: "This isn't me but I'm happy for my friends." Will and Grace (NBC) #5: "This isn't me but I'm happy for my friends." Will & Grace is a hilarious series about two best friends. The twist is that Will is gay Grace is a straight interior designer. More than friends, but less than lovers, the two share a special bond and their personalities easily balance one another's. 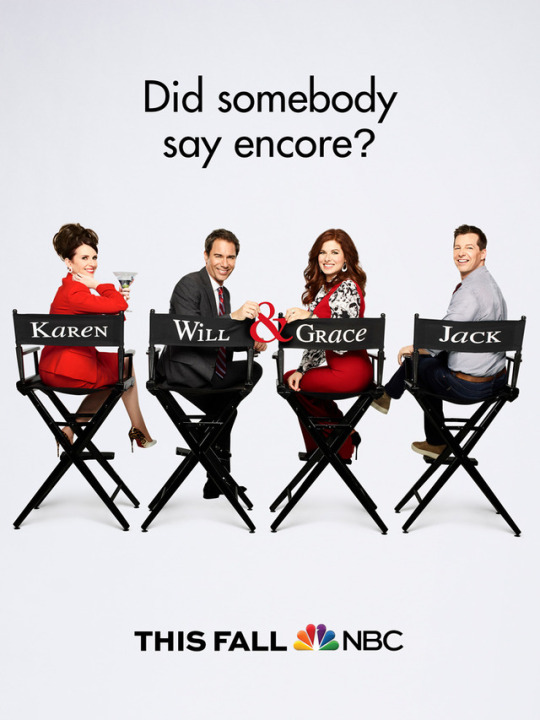 In addition to the stable Will and Grace, the show features Will's flamboyantly gay friend, Jack and Grace's sarcastic, spoiled, and boozy assistant, Karen. Will & Grace is the only series of such length (8 years) to have all of its episodes directed by the same director, in this case the talented James Burrows. Will & Grace is also one of the three series in which all of the main cast memebers won Emmy awards, with the other two shows being The Golden Girls, and All in the Family. Throughout its 8-year run, Will & Grace has been nominated for 83 Emmys, 24 Golden Globes, 14 SAG Awards and six People's Choice Awards. Among its 12 Emmy wins, the show won as Outstanding Comedy Series in 2000. In 2002, 2003, 2005, and 2006, it had more Emmy nominations than any other comedy series. Can they just show the new season already?? IKR? We still have a long wait ahead for September. That's so iconic of them do that.. It's hiatus, they've got a lot of time in their hands. Thanks for that.. I really need to finish the oldest episodes of this show.. I need to re-watch the old eps too because I haven't seen them all when they aired here many years ago. They're still at Amazon or Hulu? They are still on Hulu and I haven't check on Amazon if they do have it..